Beyond water, food, and some type of shelter, the next most important survival element is fire. Fire lifts the spirits, wards off almost all manner of beast, provides signaling, cooking, and of course heat. Fire can be tricky to start if you and your equipment have been soaked, tender is not dry, and/or wind is more than a gentle breeze. Standard cigarette lighters start failing if wet, and even dry standard strike anywhere matches are not going to burn long enough to combat windy conditions without a little luck This is where UCO Stormproof Matches become your best $6 friend. 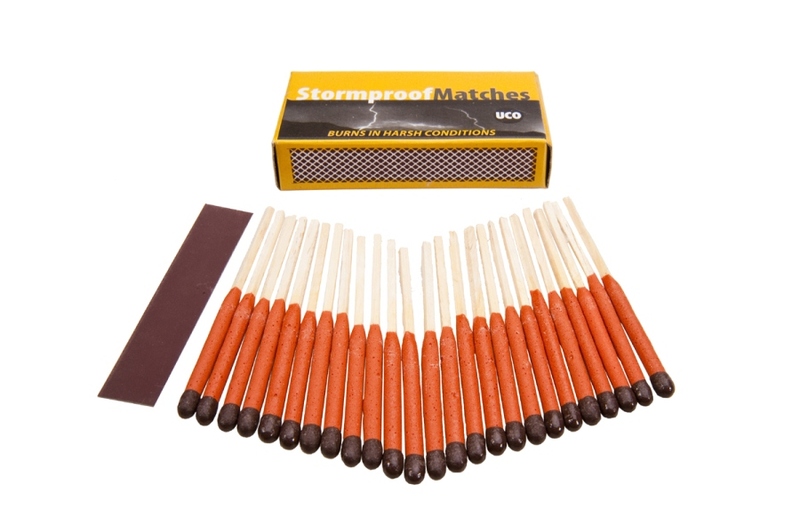 UCO offers their Stormproof Matches in $4 single and $6 twin boxes of 25 with spare strikers and also in my favorite the $6 UCO Stormproof Match Kit complete with 25 matches, extra strikers, and water tight container. I bought both, because you can never have enough waterproof matches. 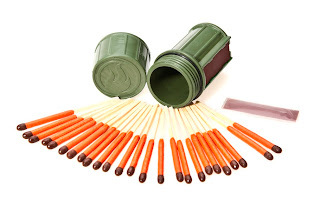 The UCO Stormproof Match Kit is a waterproof container that includes 25 matches and 3 strikers. Even though the UCO matches are waterproof, the watertight container provides an added layer of protection from the elements to assure the matches and any tender stored in the container remain dry. I like to add a couple wax soaked cotton balls. The ribbed container is easy to grip with cold hands and features an integrated striker on the outside to provide an easy location for lighting matches and can hold up to 40 matches and several back up strikers. 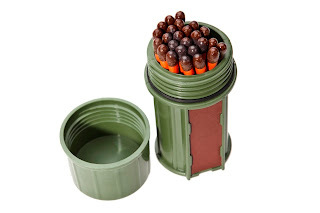 The most notable advantage of the UCO matches beyond their stormproof abilities is that they are easy to light, and will stay lit for up to 15 seconds, even after being briefly submerged in water, stomped out, or snuffed. Give the match a wave in the air and they magically relight like those trick birthday candles we had as kids. This feature is not just an initial high heat ignition and then burn time of 15 seconds as a regular strike anywhere match can do that, this is a match up to 30% longer than other matches with an ignition head of over 2” that burns welding hot for 15 seconds... and they are also waterproof. I tested the waterproofing several times and was amazed that matches with water beads still on them and in strong wind would light and burn for 15 seconds. I will tell you that 15 seconds is a long time of match ignition level heat to start even the most stubborn and damp tender. A fire steel is tremendously valuable, however I would prefer the UCO Stormproof Matches as my primary or secondary fire starting mechanism especially when the wind is high and humidity has rendered most tender useless. Over the years I have tested and used a number of various “survival” matches and none compare to the water resistance and burn time of the UCO Stormproof Matches. For the minimalist a box of these matches in a zip lock bag can save the day when you are cold, wet and tired. I even soaked a couple of the matches overnight and then pulled them out the next morning and lit them... truly the best survival matches I have found. The UCO Stormproof Matches provide cheap insurance to assure you can make fire in a light .8oz for the match boxes and 1.7oz packages for the Kit that includes the watertight container. 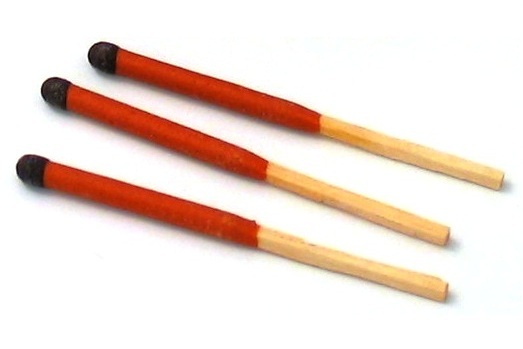 For any survivalist these matches are simply the best you can carry. Clearly these were designed by someone who has been wet and cold in windy conditions and wants fire right now. I would buy a couple packs or kits and stash them in your car and home survival kits, because you never know when you might need some fire. Below is UCO's insane testing video which the relevant tests I recreated easily and successfully. These matches are as good as UCO claims and rein as the undisputed stormproof waterproof match. UCO's Own Video Test of the Matches - I succeeded in recreating and confirming these tests. The single fact I wanted to know that I could not find in your review is whether they require the striker strip or are they 'strike anywhere' matches.